Attention all public school teachers and parents with children attending a public school! Does your school have a dual language, bilingual (those with ELL programs), or Spanish language program? 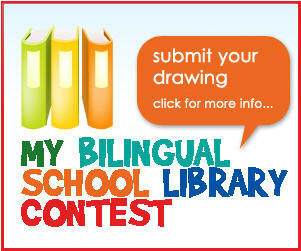 If so, then you are potentially eligible to win a set of bilingual and Spanish-language books worth $500! Mis amigas, Ana and Roxana, from Spanglish Baby have been working tirelessly for a year to put together this fabulous contest. If you are a public school teacher that meets the criteria above, and you teach 2nd and/or 3rd grade, you could win this incredible prize for your school library. All you have to do is send in a picture of a Día de los niños, Día de los libros poster that your classroom has created together. Each entry must also include a short paragraph explaining why their school should win this contest and what it would mean to them. You must hurry! The deadline for this contest is exactly one week from today, next Sunday, May 15th. Only one entry per school will be accepted. For more information, please go take a look at the contest rules.